This fort is located on a small hill in the village Paatshahapur. 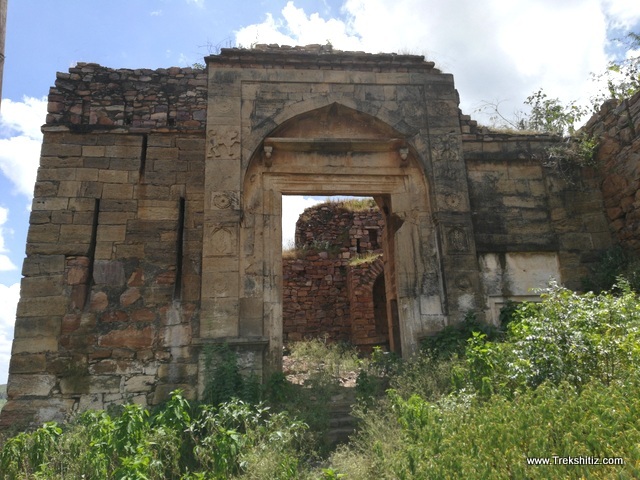 This fort which was once strong and beautiful is now in a sad state due to neglect. In one day Honnur fort and Paatshahapur fort which is further 14 kms can be visited. This fort stands right in the center of the village on top of a small hill which is surrounded by local population. Its bastions can be seen as soon as we enter the village. At the base there were a bastion and an entrance which doesn�t exist today. To reach the fort one has to circumvent the village and move towards the English school where by we come across an entrance. Further to the school there is a path which goes to the Mosque where broad stairs are built. There stairs take us to a large entrance and there are two sculptures of Sharabh and Lotus carved on the doorway. On the upper side opposite to the entrance there is a bastion which was built to protect the entrance doorway. Further there are porches built for the gatekeepers. Besides these porches opposite the entrance there is small doorway. There are a lot of thorny bushes of Babool tree due to which roaming around the area becomes difficult. On the Mumbai � Banglore highway there is a junction for Hidkal Dam. On this route 14 kms from Hidkal dam there is Paatshahapur village.